Alternative C Vials with Pure Vitamin C protects the skin from external aggressions and fights free radicals, which leads to cellular oxidation and ageing. By reducing cellular oxidation which helps to increase the development of skin cells. This improvement of cellular metabolism helps increase the natural synthesis of collagen in our skin, noticeably improving the skin’s hydration and firmness. As a result, it helps prevent and decrease the appearance of wrinkles. 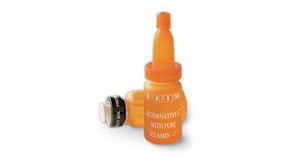 Pure Vitamin C loses its effectiveness 10 days after being made into a gel or a cream. To prevent this, our new technology incorporates Vitamin C coated with Stearylic Alcohol into the new Alternative C Cream. 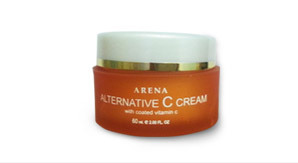 Its content in A.H.A helps helps to ensure the constant renewal of epidermal cells and increasing the action of Vitamin C.
The incorporation of Magnesium Ascorbyl Phosphate once absorbed by your skin, it will derivative the Vitamin C and transform by the phosphates of the skin into Pure Vitamin C, and keep intact the properties of the Vitamin C in an emulsion. Cucumber Extract was added to the emulsion to soften and moisturize your skin which helps to decongest your skin. 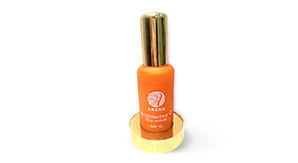 This silky emulsion helps to supply our skin with Vitamin C which gives you a fresh and pleasant feeling. It helps to reduce wrinkles and ensure your skin with firmness as well.